A speed test measures the download and upload speeds between the internet and your router. Speeds can vary depending on many factors, including how many devices are using your internet connection at the time of the speed test. It’s a good way to find out whether you are getting the level of service promised by your internet service provider (ISP). 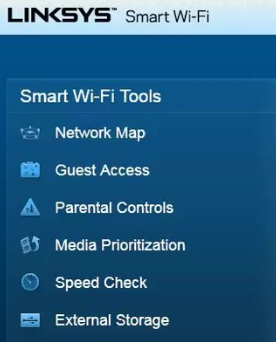 Access the Linksys EA8300 web-based setup page. For instructions, click here. A speed test is run automatically upon opening the Speed Check Tool. 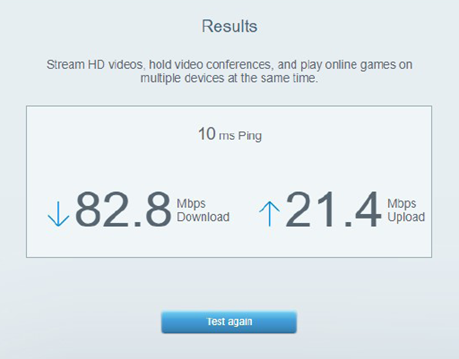 The Speed Check will display the upload and download speeds as well as the ping time. To run a test, click Test again and wait for the results. Upload speed measures how quickly you are able to upload content to the internet from your home network (e.g., uploading videos or images to a website or sending an email with attachments such as image files or documents). Download speed measures the speed of data coming to your home network (e.g., opening a website or document accessed over the internet or receiving emails and then downloading their attachments). Ping measures the amount of time it takes for data to travel from your router to the speed test servers and back.